Quyen is using Smore newsletters to spread the word online. 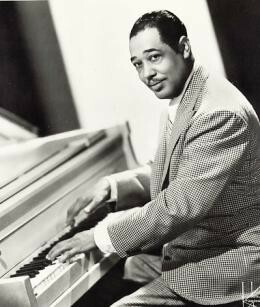 Duke Ellington was born on April 29, 1899 in Washington, DC. He began studying piano and musical aspects at the age of 7 and was raised by two parents who both had similar interests. Ellington's first piece of music was called "Soda Fountain Rag" which was about his first job. Surprisingly, before he had went into the musical business he was offered an art scholarship. His childhood was not as harsh as others, a middle classed family that supported the direction that he was heading. I would say that he lived a pretty good young life. Around the age of 17 he began to play professionally in Washington DC. Duke was one to be inspired by many different people and events. Take his first composition for example, he had created a piece of music by just taking a job as a soda jerk. He did not consider himself just a musician, but a composer, band leader, and arranger. Though these might not seem different, there are many different types of music and people who classify to that specific type of music. The term musician is only for a generalization of all who are involved in music in some professional way. Ellington's technique was a unique one that showed sophistication in jazz music like no one else has shown before. 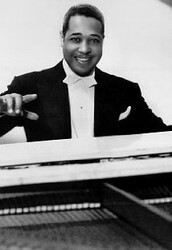 Stride piano players such as James P. Johnson and Willie Smith were some inspirations to his style. He then went to New York to pursue his musical career more, but did not succeed. Later on he returned, but this time with a group of friends which eventually became a band after practice and a few obstacles along the way. Duke also needed a team along with him for him to have any success. As talented as he is, with the compositions that he writes it could not be for a solo artist. This beginning band was known as the "Washingtonians." So this began his extreme popularity and began to form him into the musician that is a famous legend even today. As time progressed, his band grew bigger and bigger. He passed away on May 24, 1974 due to lung cancer, leaving a mark on America. Duke Ellington has impacted America's world of music in many ways. He brought a new style and sophistication to Jazz Music that nobody has ever heard or seen before. Duke had been a very powerful piano player, but after some experiences he realized that his strongest instrument was his whole orchestra. His music did not only have a story weaved into it, but his emotions and moods were clearly explained and shared throughout his compositions. Duke showed America that there could be a meaning to music, that it could be more than just sound. Music can be stories, happy and sad, ones that are joyful and upbeat against those who are full of sorrow and depression. He understood the true meaning of music, he made it more meaningful and important to everyday life. Ellington showed us both sides through his music, this began an evolution of not only the arts, but the meaning of music itself. If music didn't exist, I don't know where I'd be right now. Intelligence is very important, but there are hobbies and other activities just as important. I do not do sports, and I do not like them either, I am more of a musical person and prefer to stay in my room reading books or listening to music. To this day, music is an important part of life and new technology or traditions can never change that. "It Don't Mean a Thing (If You Ain't Got That Swing)" was Ellington's most popular song. He collaborated with Louis Armstrong to produce this song and it was placed in the Grammy Hall of Fame in 2008. It was first recorded with only Ellington and his band, but later on he added on the famous singer Louis Armstrong to be apart of the song. The significance of this song was meant to be an expression to all jazz musicians alike using the term "swing" which meant "big band" or something to that matter. Both Louis and Duke were leaders of some sort of band so the message implies on how important having a group to support the sound and the music with. Everyone is talented as a solo individual, but it takes a real band leader to bring all those solo artists together to meld into a perfect band that works together and complements each other sounds. This expression meant a lot to both of them since they both were bandleaders and were talented solo artists as well. This phrase is still sometimes repeated today and the song itself is still known. At age 19, he had married a woman named Edna Thompson and they had dated since high school. Shortly after their marriage, Edna gave birth to their only child. It was a boy named Mercer Kennedy Ellington. They almost immediately seperated after Mercer and Edna had traveled to New York to be with Duke. Edna claimed that she was "homesick for Washington" and returned to her home. Duke later had a second companion that went by the name of Mildred Dixon, she traveled with him and managed Tempo Music. Mercer referred to Mildred as his mother. The Cotton Club was where Duke's band what nationally popular. They had stationed a spot there and performed often when they were not as popular as they were in the future. After Duke had died, his son Mercer took over his band and led them until he died. The man below is Dave Douglas. Now a days, not many artists write their own music and just buy it off of songwriters to perform. Pop is a lot more listened to in modern days and jazz and the blues are not as popular. Douglas has combined the both to make jazzy pop compositions and writes all of his own songs. Dave plays the trumpet and has been playing professionally since 2005. Though, this man can perform solo like Ellington could but sounds much better in his group. 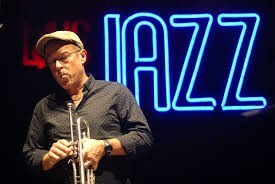 Dave Douglas has a quintet of various musicians and are known as the Dave Douglas Quintet. Looking into Dave's music, many of them show stories or powerful emotional messages. This was almost exactly how Ellington's music was. Dave and Duke are much alike when it comes to their taste in music and their careers as solo and group artists. "You've got to find a way of saying it without saying it." His real first name was Edward, Duke was just a nickname that he had earned. He was one of the few musicians that wrote the music that they performed and got famous for. Duke and his band were in business for about 50 years. He did not only write Jazz Music, he wrote many other different types of music but was only famous for his jazz music. He won many awards, even after he had passed away.